Fenland Rods fished the Oak Pool at Decoy Lakes on Sunday with all those down at the top end of the lake find ing plenty of bites while several pegged at the car park end found it tough going. Leading the way from peg 13 was Matthew Lutkin, who fished sweetcorn in to the corner for a winning weight of 86lb 5oz. Second was Kevin Lee with a net of barbel weighing 80lb 4oz, then came John Garner with 76lb 4oz and Dave Garner on 67lb 13oz. John Belshaw topped the Decoy Lakes Over 55s field on the Yew Pool with 141lb 10oz from peg 15. He caught well on pellet but it was the switch to cat meat that saw him brush aside the opposition as he took carp well into double figures. Roy Whincup came second with 117lb 2oz, followed by Mick King on 105lb. 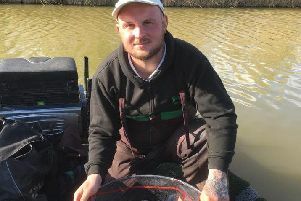 Tony Moulds won the latest Haddon Lodge match with a net of skimmers weighing 11lb 13oz. George Bates (11lb 11oz) was second and then it was Lucio Melillo Junior third place on 11lb 5oz.